Sport climbing is one of those hobbies that’s mostly free and extremely accessible once you own the gear. Our editor and his wife recently learned the ropes of sport climbing and accumulated the basic gear needed to hit the crag. If you’re interested in sport climbing, you probably want to begin by buying only the essential gear — just enough to show up at the crag and start climbing safely. That’s the logic my wife and I followed as we amassed a basic sport climbing setup. Tired of continually paying to rent old and smelly climbing shoes at gyms, I made Five Ten Rogue climbing shoes the first piece of climbing gear I ever bought. Mine are probably 10 years old now, and the rubber at the toes is just now starting to peel away. They’re still extremely comfortable though, with Velcro straps that make them easy to put on and take off. At my skill level, many routes don’t require particularly aggressive shoes. For me, it’s more about being able to practice longer and get more reps in. These are quality starter shoes that allow me to do just that for right around $100. My wife raves about her La Sportiva Mythos shoes. These are not particularly cheap beginner shoes, but they’re made to last and darn comfortable. She wears them on 90 percent of her sport climbs. For routes that are more delicate or overhanging, she switches to her Scarpa Vapor V shoes for more precision. Their edges are more precise, and the downturned toes help with foot placement on overhangs. These are a more aggressive option, so she doesn’t wear them long. But she has found that they give her extra confidence on harder routes. A chalk bag is nice to have on hand, especially on hotter days when sweat is a factor. Any chalk bag will do the trick, so we went for looks when buying ours. With the Metolius Access Fund bag, a portion of the proceeds goes to the Access Fund to help protect American climbing areas. My wife’s STATIC Artist Series bag isn’t cheap, but how can you beat the beautiful watercolor artwork of Yosemite? Dubbed “America’s #1 climbing chalk,” Metolius’ Super Chalk is what we’re currently dumping into our chalk bags. We like the resealable bag and the low price ($4.50). Before hopping on a sport route, we often mix our hands in the stuff for sweat absorption and extra friction on the wall. I’ll be honest: Both of these harnesses were given to us by friends who had extras. But when you’re first getting into sport climbing, any climbing harness from a known brand should do. The Black Diamond Zone harness is lightweight, affordable, and well padded. The four gear loops hold plenty of quickdraws and carabiners, and, most importantly, it fits me like a glove. 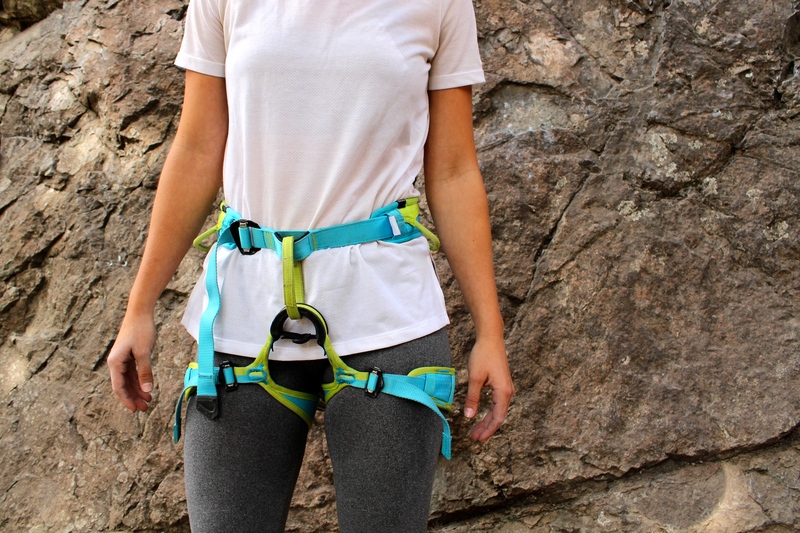 My wife uses Edelrid’s Jayne II harness ($60) and has no complaints (except maybe the bright neon colors). It’s ultra-adjustable and has plenty of attachment options for racking gear. We like the package deal that comes with Black Diamond’s ATC-XP belay device: It includes a Mini Pearabiner screwgate locking carabiner. 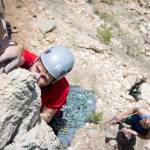 It’s all you need to belay someone! The carabiner secures the rope and belay device to your harness while the ATC-XP belay device is simple and user-friendly. Its high-friction grooves offer three times greater hold than non-jagged tube-style belay devices, which is key when my 105-pound wife belays my 155-pound frame. A climbing friend once told us that when you first start climbing, just buy the most inexpensive climbing rope you can find. 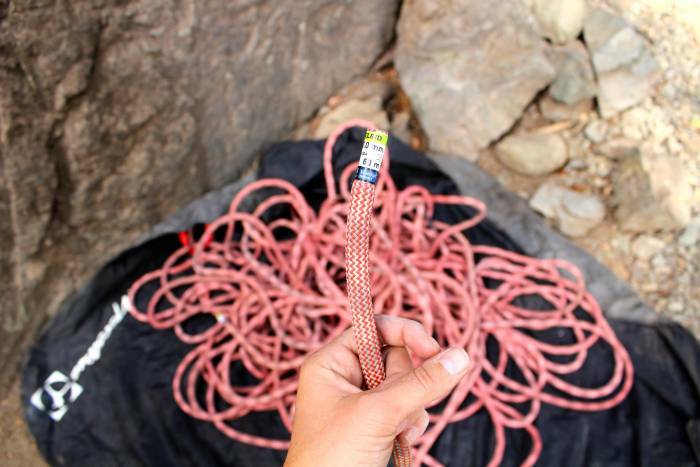 We took that advice to heart and found this Edelrid Python 10mm x 60m Non-Dry Rope during REI’s Anniversary Sale. When we took a beginner’s sport climbing course at a climbing gym, our instructor confidently told us that a 60- or 70-m rope would be plenty long to start with. So far, we’ve loved our Edelrid rope and have no qualms. 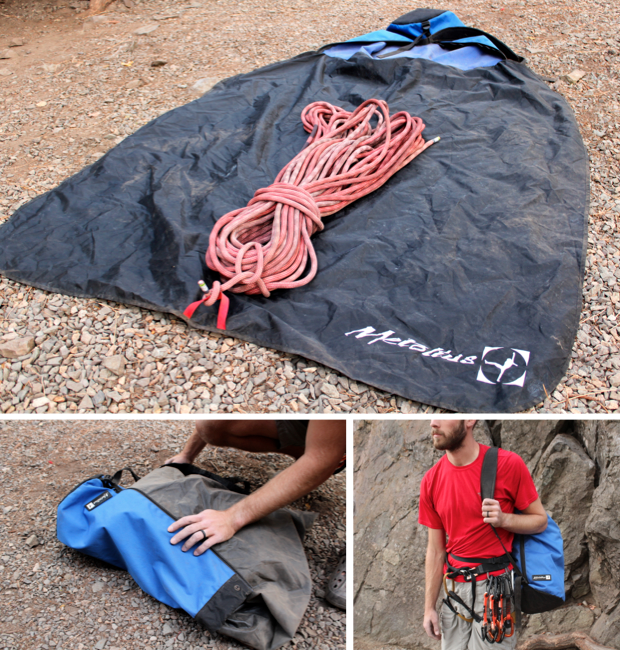 A rope bag is the easiest way to keep your climbing rope organized and clean. We like Metolius’ Dirt Bag II, which fully unzips to reveal a large tarp that offers plenty of space to flake the rope out onto and belay from. 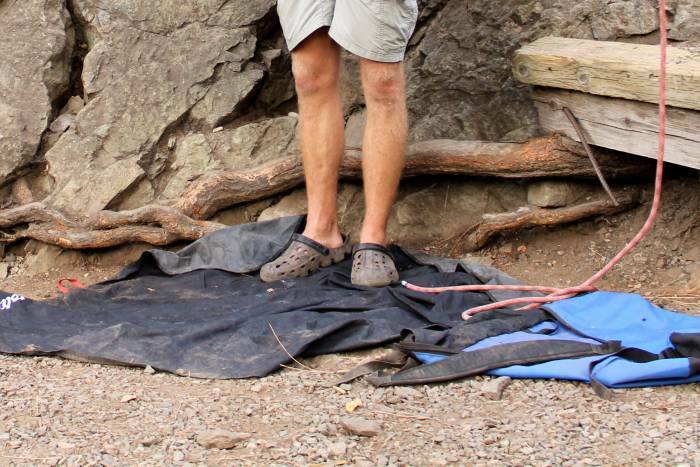 Using the tarp keeps the rope from dragging in the dirt or across rocks. 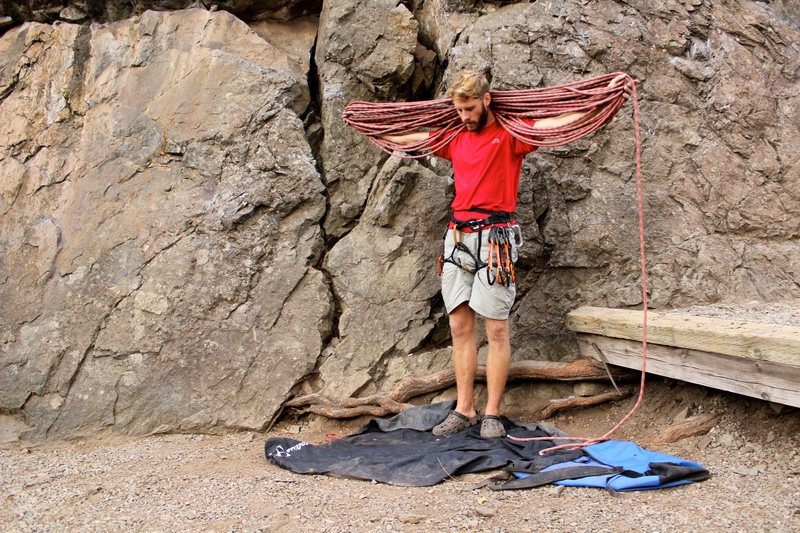 Once the climbing day is done, simply tie the rope up, place it in the tarp, wrap the tarp around the rope, fold the bundle into the bag, and zip it up. Then, the rope is secure and is easily carried to and from the crag with the bag’s shoulder strap. Falling on a sport climb can be jarring. Often, you free fall a few body lengths until being caught by your closest quickdraw. 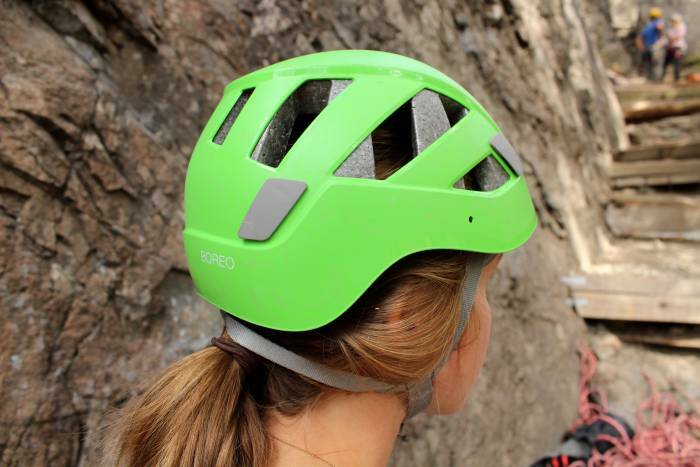 A climbing helmet is crucial for protecting your head from injury on the route. Beyond protection when falling, we can’t count how many times we’ve bumped our heads on an overhanging rock while climbing. Also, we always wear a helmet when belaying to shield any falling rocks. Petzl’s Boreo helmet is a budget-friendly option that stays stable on the head and is easily adjustable for sharing with friends. For an entry-level sport climbing kit, we’d recommend a minimum of eight quickdraws. Along the route, you clip these into bolts in the wall and clip your rope into the other end. This system is your protection if you were to fall. We started with seven Metolius Bravo Wiregate quickdraws and added four Black Diamond FreeWire quickdraws to our set, which enabled us to climb longer routes. The Black Diamond FreeWire quickdraws can be bought individually or as a set of six. 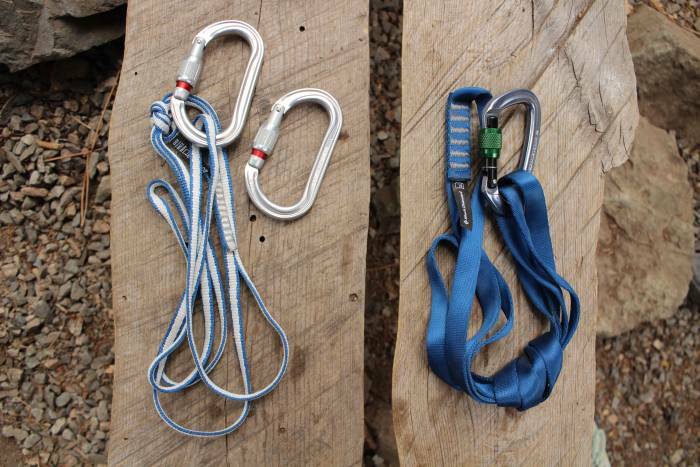 Slings are most often used (in conjunction with a locking carabiner) when cleaning an anchor at the top of a climbing route. My wife and I each have a 120cm sling, which we attach to our harness and clip directly into chains or a bolt. This allows us to remove our quickdraws from the anchor and thread our rope through the rings before rappelling down a route. We like the 120-cm length, as it gives a longer reach yet can be doubled-back or knotted if shorter length is required. In total, my wife and I have five locking carabiners. 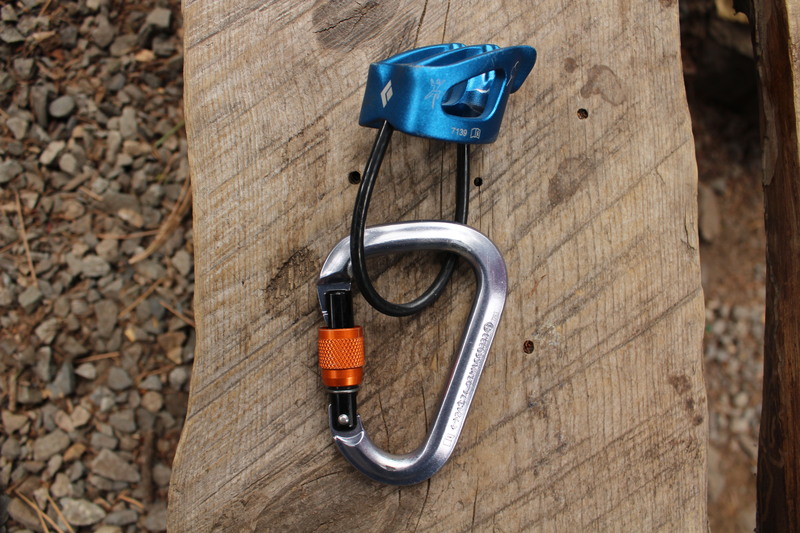 We use the Black Diamond Positron Screwgate with our ATC belay device while the Petzl OK Oval Screwgate carabiners connect to our slings when we clean an anchor. 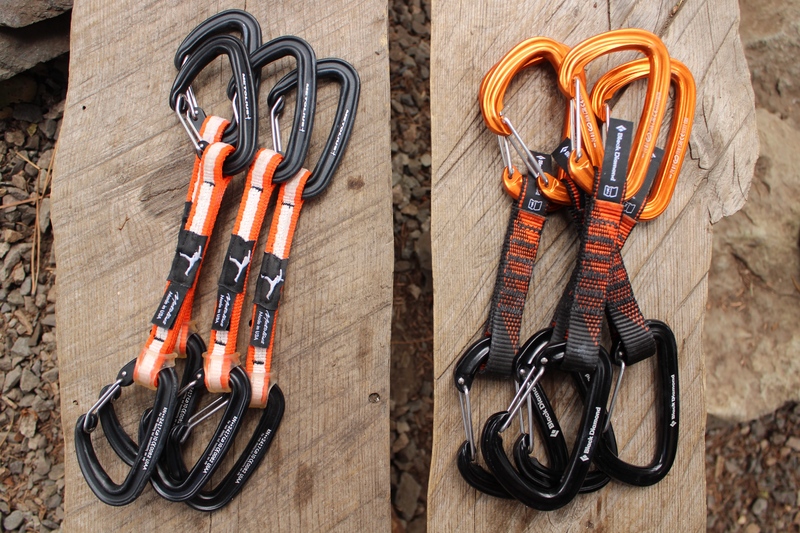 The “pear-shaped” locking carabiners are preferred for belaying, and the oval-shaped carabiners are more user-friendly with slings and at anchors. 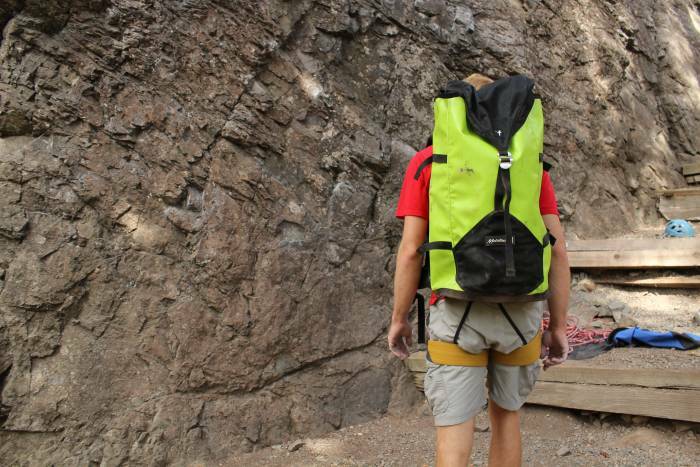 Though you could technically make do with a standard hiking backpack, we really like the Metolius Freerider crag climbing pack. Its main opening is huge and easily fits all sorts of climbing gear. At the top, there’s an additional compression strap for attaching rope or jackets, and there are plenty of gear loops throughout. The chest and hip belts make for a comfy carry and we especially like the zippered lid pocket for keys, phones, wallets, and other valuable items. Instead of attaching our gear all around a hiking backpack, we can simply toss everything into the Freerider and head to the crag. 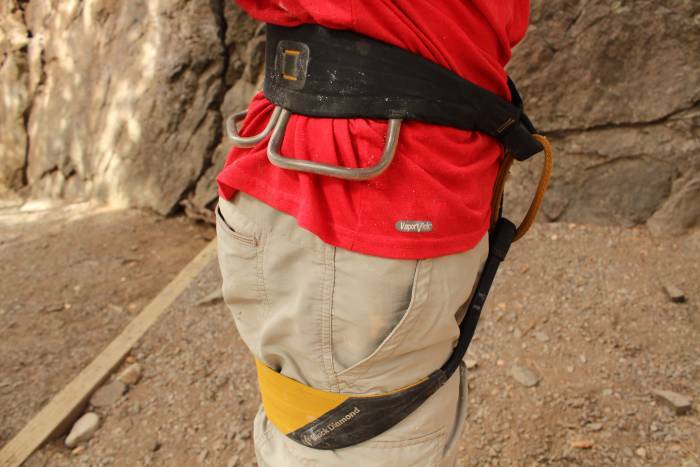 No, this piece of gear isn’t a sport climbing “essential,” though it has proven invaluable. 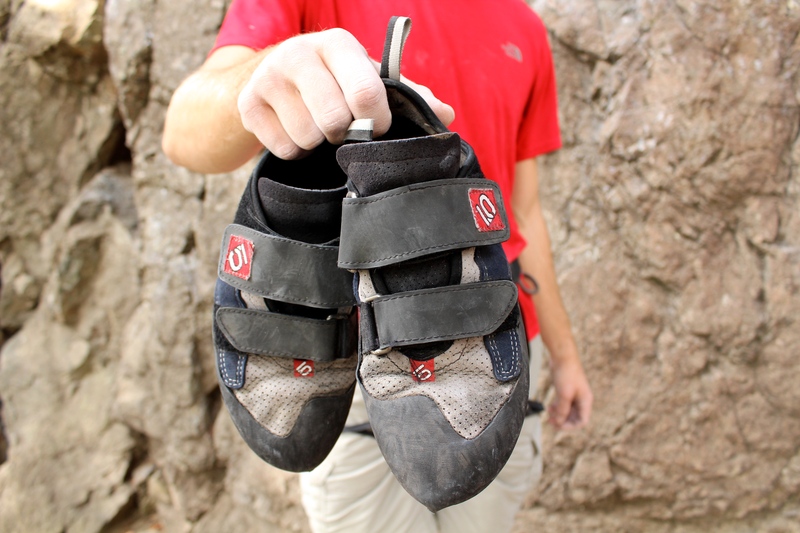 After a route, there’s nothing better than removing tight, sweaty climbing shoes and slipping into a pair of sandals. We like the $10 Crocs from Walmart. They provide toe protection and are easy to slip into, lightweight, and breathable. When not on the wall, I’m in these puppies feeling (and looking) good.